Heads of state including the current presidents of Mexico and Colombia have called for alternatives to drug prohibition to be considered. Leading civil rights groups have called for an end to the war on drugs in its current form. And yet -- and yet -- the federal government under President Obama has escalated its campaign to crush California's medical marijuana industry to its broadest and most aggressive level yet. Will the next shoe drop in other medical marijuana states too? We need your help to decide whether StoptheDrugWar.org -- our movement-building work; our organizational coalitions; our leading online publications like the Drug War Chronicle newsletter that keep the movement, journalists, policymakers and countless others informed and empowered -- can enter this historical moment at full strength. Will you step up today in meeting both the crisis and the phenomenal opportunities? 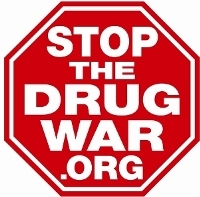 Please make a generous donation to StoptheDrugWar.org -- non-deductible for our lobbying work, or tax-deductible for our educational work -- to help us make this decision the way it should be made. Along with these needs of the time, there are some specific reasons we need your help now, rather than December when many people make their donations. One of the reasons is that we need to make a decision over the next two weeks as to whether we can continue to use the high-powered legislative and email list service that has helped us so much during the past two years. Along with reliably delivering our email to all our subscribers -- a tough job in this time of spam and false spam positives -- this system is what's enabled us to launch our major new Legislative Center. If you haven't already, please check out our compilation of hundreds of federal and state bills and votes, legislator scorecards, media and voter registration tools and more. We will not be able to continue this program without your donations. A second specific need right now is that our blogger, Scott Morgan, has recently been able to return after work on other projects, but we need your support to afford his part-time but critical work on a consistent basis. Scott, recently named the High Times Freedom Fighter of the Month, was the leading voice in the blogosphere for marijuana legalization during the months running up to last year's Prop 19 vote, and he is a regularly reach tens of thousands of readers leading online voice highlighting President Obama's refusal to engage in a serious discussion of the marijuana issue. His posts reach many more on sites like Reddit.com and the Huffington post and citations on major issue blogs like the Daily Dish. Our web site traffic took a hit during his absence, and it's grown again since his return. Scott has always done what he could even when funds were short, but we need to let him know sooner rather than later what our situation is. Next: Chicago to Decriminalize Marijuana Possession? A Plant, for Chrissakes - don´t play their dirty game anymore! Why don´t we tie this in with the world-revolution going on: Use the oldest and most versatile healing-herb known to man out in the open - everywhere! Plant seeds wherever you can - all out in the open - the more public the better! I will never again make a secret out of my passion for this spirit! Let us stand by Mary´s side and tell anyone who will listen: She will lead us to the GOLDEN AGE! As long as you are NOT afraid - as long as you are aware that you are doing the right thing - the dark forces have no access and will not harm you! It´s all a matter of vibration!